18-year-old shooter among the dead. Police officers respond to a&nbsp;shooting at the Olympia mall in Munich, Germany, on Friday. Police officers respond to a shooting at the Olympia mall in Munich, Germany, on Friday. 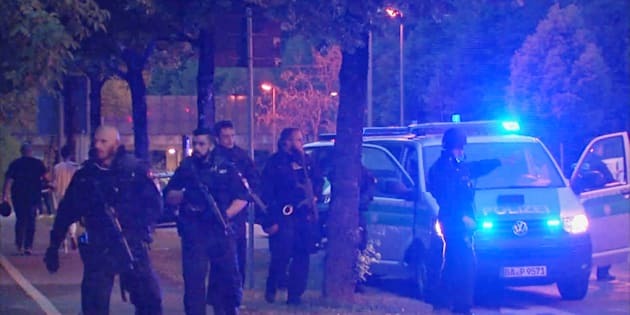 A lone, 18-year-old gunman killed nine people and wounded 27 more during a devastating shooting spree near a shopping mall in Munich, Germany on Friday evening. He had no connection to ISIS, and “no link whatsoever to the topic of refugees,” Munich police chief Hubertus Andrae said on Saturday. Several children were among those injured in the rampage that sent customers and workers fleeing. Three of those wounded were in critical condition, and 10 were “seriously injured,” Andrae said. The gunman was an 18-year-old German-Iranian from Munich who killed himself, police said. They found his body on a street. Soon after, authorities searched his family’s apartment and found a book, “Rampage in My Mind ― Why Students Kill,” in a bedroom, according to Robert Heimberger, president of the Bavarian State Criminal Police Office. The shooting began at a McDonald’s at the Munich Olympia mall shortly before 6 p.m. local time. Initially, authorities locked down the terrified city to search for up to three gunmen, possibly carrying rifles. But the hours-long manhunt eventually revealed a sole shooter who had used a pistol. “Many shots were fired, I can’t say how many but it’s been a lot,” one mall employee told Reuters, saying that staff were still hiding in storage rooms. The shopping center is next to Munich’s Olympic stadium, the site of the 1972 Olympic Games, which turned into a tragedy when the Palestinian militant group Black September took 11 Israeli athletes hostage and eventually killed them. The police closed off a wide area around the shopping center and urged people to stay indoors, saying a large police operation was underway. Authorities declared a state of emergency in Munich after the shooting, German television station NTV reported. Witnesses posted images and live video on social media of people fleeing the scene and paramedics tending to people lying wounded in the streets. Meanwhile, people around the world expressed solidarity with the German city. Surrounding cities are also pitching in. Fire department crews from Germering, Gilching and Fürstenfeldbruck sped toward Munich on Friday to assist. #prayformunich #prayfortheworld Mal ernsthaft jetzt,wozu haben wir Menschen ein Gehirn? Manche müssen echt noch lernen das ein Gehirn nicht nur Deko ist sondern auch mal eingesetzt werden muss! President Barack Obama called Germany a close ally on Friday evening, and said the U.S. will “pledge all the support that they may need” in the investigation. “The resolve of Germany, the United States, and the broader international community will remain unshaken in the face of acts of despicable violence such as this,” the White House said in a statement. The attack was the third major act of violence against civilian targets to take place in Western Europe in eight days. On Friday, 17-year-old asylum seeker wielding an axe wounded four passengers on a German train before he was shot dead by police. The week before, a Tunisian drove a truck into crowds celebrating Bastille Day in the French city of Nice, killing 84. Both attacks were claimed by the Islamic State militant group. A poll published earlier Friday showed that 77 percent of Germans feared a terror attack in the near future, up from 69 percent earlier this month. Members of the anti-immigrant Alternative for Germany party were quick to blame Merkel and her policy toward refugees for the shooting. “The terror is back! When will Mrs. Merkel finally close the borders!” the party’s Saxony branch wrote on Twitter after the attack. Read more on HuffPost Germany. Police officers respond to the shooting in Munich, Germany on July 22, 2016.